Back in December, I did a Patreon Spotlight for Ben Bishop’s (The Lost Trail: Nine Days Alone in the Wilderness, Nathan the Caveman) post apocalyptic graphic novel, The Aggregate. Bishop invites us to imagine “if all the Power Rangers were evil, and they wanted to use their Megazord to wipe out most of the people on Earth, and Mad Max was a girl, AND he fell in love with the Red Ranger…” Doesn’t this sound amazing? Recently, the artist and author decided to utilize Kickstarter as the platform to make this book happen. One of the first “choose your own adventure” style graphic novels – or as Bishop calls it, “Split Decision Comics” – the Kickstarter opened up yesterday morning, and has already exceeded its $10,000 goal! But with 28 days left in the campaign, there are still plenty of opportunities to support this endeavor — including pushing the project up to its second goal of $20,000, allowing Bishop to offer the book in full color. 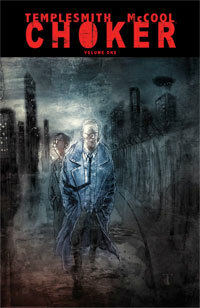 Okay folks, I’ve got two names for you: Lovecraft and Templesmith. ‘Nuff said, right? I’m all about H.P. Lovecraft‘s works; as a matter of fact, I’m wearing a Cthulhu/Peanuts mashup shirt right now! 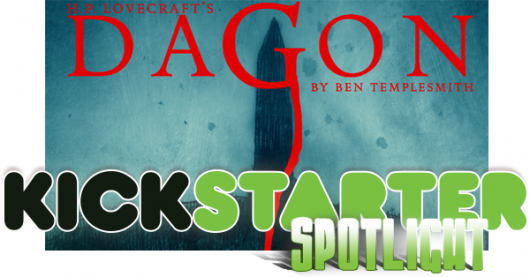 So seeing a Kickstarter for DAGON by H.P. 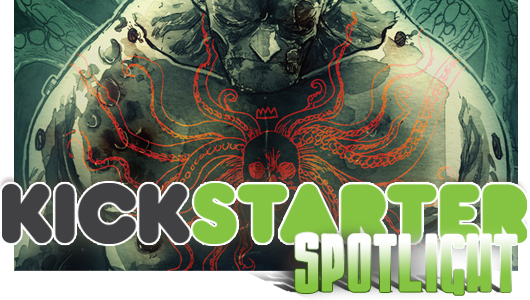 Lovecraft & Ben Templesmith was a must for me to support and share with you fine folks! This year marks the 125th anniversary of H.P. 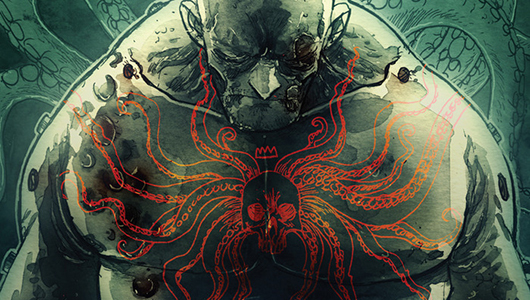 Lovecraft’s birth and Ben Templesmith is celebrating the occasion by adapting Dagon into comic book form. 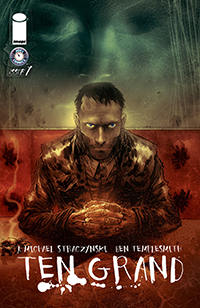 Since this Lovecraft story was the first one that Templesmith read, it holds a very special place in his heart. And knowing how Templesmith does a great job at literally everything I’ve ever seen him work on, this is going to be awesome! Based on a short story revolving around a shipwrecked mariner, this horror tale is one of the first stories Lovecraft published (in this case it was 1919). I won’t go into too much regarding the story, but suffice to say that as with most things Lovecraftian, it’s not likely to end well. Dark and deadly, his tales rely heavily on the reader’s imagination to fill in the more macabre sections. Have you ever had one of those days where it seems like the world is conspiring against you? Well, I’ve had one of those months. But right in the middle of what has been a pretty cruddy time, I got the chance to get a few answers from none other than Ben Templesmith himself! Talk about making my day/week/month! If you don’t recognize the name then you just aren’t paying attention. This man is a comic book demigod! He’s done a little bit of everything, most notably being the co-creator and artist for 30 Days of Night, Fell, and Shadowplay…not to mention working on a ton of other projects in one capacity or another. I got the chance to ask him a few questions about his newest project, THE SQUIDDER (read more about it in my Kickstarter Spotlight). Read below what he had to say regarding the Kickstarter fundraising and success he’s had with it so far. And if you haven’t checked out this project yet, do so right here. It’s going to be tentacles above the rest! 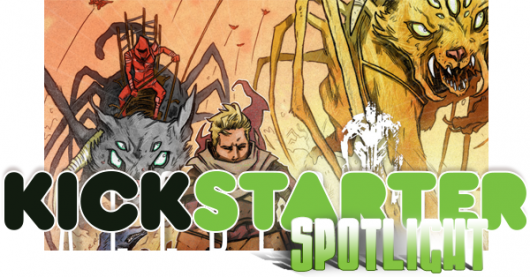 There are a lot of Kickstarter campaigns out there trying to get you to part with your hard-earned cash. But how many of them can say they are from Ben Templesmith and 44FLOOD? That’s what sets THE SQUIDDER apart from all the rest and that’s why we want to bring it to your attention, because these folks do their due diligence when it comes to putting together an awesome project. If you love Lovecraft’s Cthulhu and want to see it take a science fiction-inspired leap forward, then this is the one for you. 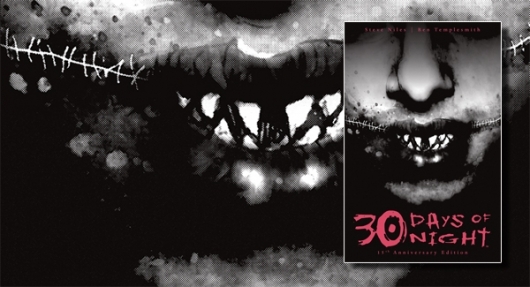 Described as “an original graphic novel about an old soldier from a forgotten war in a post-apocalyptic world that has left him behind,” this is the first creator-run book from Templesmith in five years. It’s something near and dear to his heart so I have no doubt it’s going to be excellent from start to finish. Not to mention the fact that this Kickstarter beat it’s goal so well that they upped the length from 108 pages to 144 pages (33% more)! 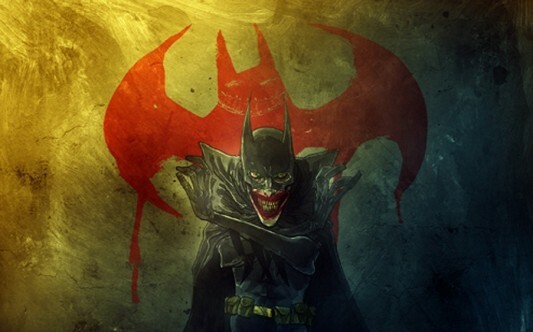 Check out the video below for more information direct from Ben Templesmith himself. In Choker, Johnny Jackson is a hard-boiled Private Investigator or Gumshoe and he has the cigarettes, trenchcoat, cramped messy office, surly demeanor, and the contempt for the police force that canned him to prove it. What the reader is supposed to assume is he now leads a life of obscurity blurred by booze (even if the first scene finds him spying on the mayor’s dalliances), but is about to get his one shot at public redemption when the cops call upon him to catch the drug dealer “Hunt Cassidy” he locked up years earlier. Jackson is surely an antihero with a vulgar mouth and skeletons in the closet, but he is not without his charms. At his most human we see him caring for his kind and nerdy assistant Seaton Price. With a backstory that is highlighted by the Shotgun Police Force forcing him to take an experimental drug called “Man Plus” which is supposed to turn ordinary civil servants into robocops, Jackson evokes sympathy after being left with a serious side effect that comes to define him. A vise-like gripping hand that has a mind of its own earns him the unfortunate moniker “Choker,” and robs him of his badge and dignity after being deemed a danger to others.